Is one search engine safer than another? Question of the week: Since I have been using avast! I have been conscious of staying secure online. Does it matter which search engine I use? Is one safer than the other? Thanks for using avast! to protect your computer. Yours is a great question, but maybe not one that people consider when thinking about the security of their system. A recent 18-month study by the German Security firm AV-TEST Institute revealed that search results about breaking news stories, like the recent bombing at the Boston Marathon, frequently contain malicious links. People seek news quickly and they click on the links at the top of results without stopping to consider their safety or reliability. PCs without reliable security software soon become infected. AV-TEST evaluated about 40 million websites and found that Google is the safest way to search if you want to avoid malware. 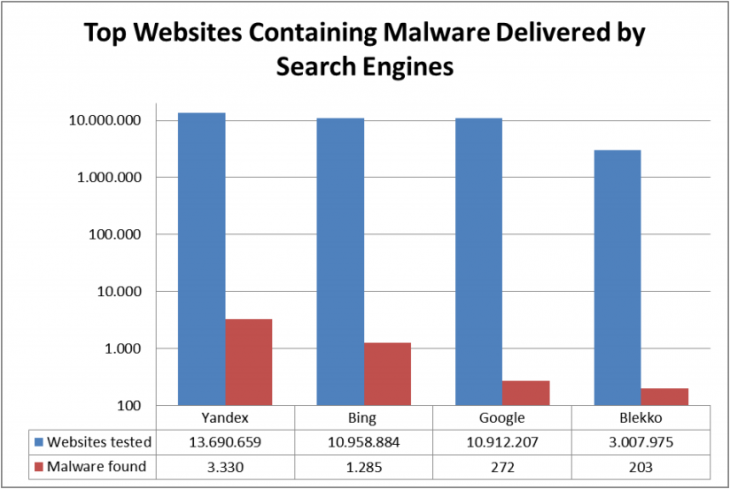 It’s rival Bing delivered five times more malicious websites in search results than Google. Yandex, Russia’s popular search engine, performed even worse than Bing delivering 10 times as many infected websites as compared to Google. This chart shows the results from Yandex, Bing, Google, and Blekko. Microsoft response to AV-Test- "We show results with warnings for about 0.04% of all searches, meaning about 1 in 2,500 search result pages will have a result with a malware warning on it. Of those, only a small proportion of malicious links ever get clicked and the warning therefore triggered, so a user will see the warning only 1 in every 10,000 searches. In any case, the overall scale of the problem is very small." Yandex response to AV-Test - "Yandex uses its own proprietary antivirus technology to protect users from malicious software," reads an email from the company. "Yandex marks the infected webpages in its search results in order to notify users of unsafe content. We just notify users of possible consequences and do not block access to the webpage completely."